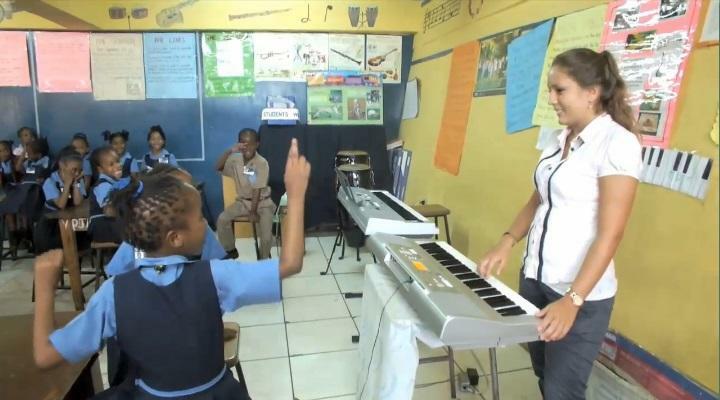 The Music Project in Jamaica involves working in a school setting. The school music project gives volunteers the option of teaching secondary school level or primary school level. This project allows you to teach music to children or teenagers to help them develop their awareness and appreciation of music, and learn how to play a musical instrument. The project focuses on both traditional Jamaican music and incorporates the cultural influences of volunteers from all over the world. Volunteers who prefer to work in a secondary school will assist the music teacher in teaching students how to play various instruments; mainly the piano, recorder and guitar. The children are aged between 12 and 18. There are also older students who study music as a part of their external exams. At certain times you may be required to do individual tutoring with these students to sharpen their knowledge and skills for the theoretical and practical aspects of their exams. Working in a primary school, the basic aim of teaching music is to use your skills, knowledge and experience in music to enhance numeracy and literacy. You will be required to prepare songs or use musical instruments to reinforce the lessons taught by the teachers. It is therefore important to work closely with the teachers to find out the topics of the lessons and decide how best to incorporate the musical aspect. Volunteers who are skilled in teaching singing can use their skills in conducting rehearsals with the school choir. We encourage volunteers to also use their singing and instrumental skills to teach the children songs so they can perform at the school’s devotional sessions. When teaching at a school, you will be required to teach large classes of over 30 students with limited resources and classroom space. It is therefore important that volunteers be enthusiastic about music and able to inspire the children to develop both theoretical and practical musical knowledge and skills. In order to help and support music project volunteers, one of our local staff will organise regular workshops. The workshops will provide you with tools and tips on how to better organise your work, let you discuss and solve any issues and will be an opportunity to receive and give feedback. You will also be able to learn some new activities to carry out at your placement. Projects Abroad and the partner organisations will provide all the necessary materials and resources you may need during your time on this project. However please feel free to bring along your musical instrument. Please let us know if you have any preferences when you apply. As this project is based in a school, it is not possible to join during the main school summer holidays from July to August. You can join the Music Project in Jamaica for two or three weeks if you don't have time to join us for four weeks or more. This project has been selected by our local colleagues as being suitable for short term volunteering for both the placement and you, the volunteer; however, please be aware that you may not be able to make the same impact as someone volunteering for a longer period.